The Stalingrad counteroffensive, Operation Uranus, exposed the Red Army's urgent need for mobile heavy guns. Primary targets for these guns were German fortifications in and around Stalingrad. At the time Soviet front-line ground units did not possess sufficient firepower to deal with pillboxes and other fortifications. Close support of artillery and combat engineers was an important factor in the success of Operation Uranus. However, with rare exceptions, all Soviet guns and howitzers at this time were towed rather than self-propelled. This lack of mobility proved to be greatly exacerbated by the absence of roads, the presence of deep snow cover and a scarcity of artillery tractors. Towed guns were also highly vulnerable to counterattack while on the move, especially since they were often hauled by horses or their own crews. The 152 mm heavy howitzers were particularly difficult to maneuver; owing to their great weight and narrow steel wheels, they were incapable of crossing rivers on anything but tank bridges and were prone to becoming hopelessly mired and needing to be abandoned by their crews. This situation did not satisfy the state authorities. In November 1942 the State Defense Committee ordered the development of a heavy self-propelled gun armed with the 152.4mm ML-20 howitzer. It should be noted that the Red Army had dedicated anti-fortification vehicles in the pre-war period, such as the KV-2 heavy tank armed with the 152.4 mm M-10 howitzer. The design proved unsatisfactory for numerous reasons, including a lethally-high silhouette, a sluggish and barely-functional manual turret traverse, a slow reload rate, and a high center of gravity which risked tipping the vehicle over when attempting to surmount even small obstacles. Mass production of KV-2s ceased in July 1941 and a few survived to November 1942. The new anti-fortification vehicle was designed with the same purpose in mind, but with higher mobility, heavier armor, reduced production cost, and the more powerful and accurate ML-20 152mm gun. Mounting the ML-20 in a turret was impossible due to its length and recoil, and it was eventually decided that the new vehicle should have a non-rotating gun mounted in a fixed casemate-style superstructure. Prior to the issue of the State Defense Committee order there were several other anti-fortification vehicle projects, all of which were halted. Later in the war these projects were restarted. In December 1942 three different designs of "pillbox killer" vehicles were introduced by various engineer groups from the major Soviet artillery and tank factories. All of these designs used the ML-20 gun as a primary armament, with the KV-1S heavy tank chassis. 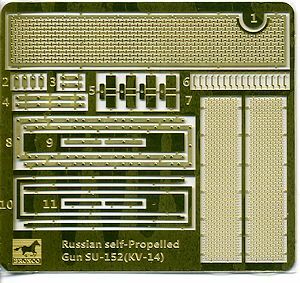 After some discussion, the project of Joseph Yakovlevich Kotin was chosen for further mass production. This design successfully combined the ML-20 and KV-1S chassis with minimal expense. The entire project was designated "KV-14" and assembly of the first prototype (called "Object 236") began on December 31, 1942. It was completed after 25 days. Plant trials of "Object 236" began on January 25, 1943. After a number of successful plant tests the more stringent state tests began. "Object 236" succeeded again. On February 14, 1943 the State Defense Committee accepted it for Red Army service and immediately launched it into mass production at the	Chelyabinskiy Kirovskiy Zavod (Chelyabinsk Kirov Plant, ChKZ). 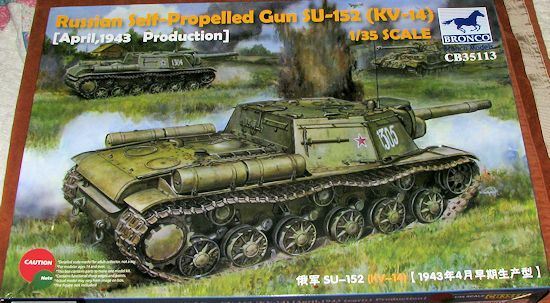 The designation of the series of self-propelled guns was changed from KV-14 to SU-152. The ML-20 gun was slightly modified for mounting in the SU-152 — some handles were moved for improved gunner comfort. This variant had the designation ML-20S. The muzzle velocity and external ballistics were identical to the original towed ML-20 gun. Although designed with no consideration for the anti-tank role, the SU-152 proved to have surprisingly good anti-tank capabilities due to the ML-20S's extremely heavy HE projectiles. Standard doctrine for purpose-built AT guns of the period universally relied on small, dense solid projectiles propelled to high velocities, optimized for punching through armor. Since the SU-152, like all SU-series self-propelled guns was not designed with tank killing in mind, no AP projectiles were issued to crews and no initial tests against armor were conducted. However, tests performed on captured Tiger tanks in early 1943 showed that the SU-152 was able to destroy them at any range with a fair degree of reliability (the only vehicle then in Russian service capable of doing so) by simply blowing the turret off the vehicle through sheer blast effect. This fortuitous discovery spurred massive SU-152 production and the formation of self-propelled artillery units, which then functioned as ersatz heavy tank destroyer battalions. After the launch of SU-152 mass production the design was slightly modified to improve reliability. Initially the SU-152 lacked a machine gun, which was recognized as a severe weakness in urban warfare and other close combat. To solve this problem the DShK 12.7 mm anti-aircraft gun installation was developed in the summer of 1943. Some SU-152s received it after repair. The SU-152 was the last member of the KV family of tanks in mass production, and was replaced by the ISU-152 on the ChKZ production lines in December 1943. The exact number of SU-152s produced differs even in Russian sources, with the most common figures being 670 or 704. The SU-152s that survived World War II were withdrawn from Soviet Army service in 1954. 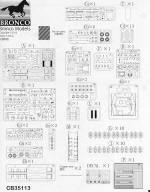 Bronco has added another highly detailed armor kit to its growing inventory. This one is molded in a brownish olive plastic with very nicely done surface detail. The kit includes a photo etch fret for engine screens, screen mounts and spare link brackets. I appreciate that the p.e. is held to a minimum and I'm sure there are other builders who would agree with this. There are also a couple of sections of copper wire to use for the tow cables. There is quite a bit of detail on the inside of the hull. That includes a driver's position, crew seats, inner suspension mounts, and an engine. Now while much of this is hidden from view, you have the ability to pose the various hatches open if you wish. Builders who wish to leave out much of the interior detail can do so by simply cementing the hatches closed. I'd at least install the engine as you should be able to see that through the cooling screens. The gun is very nicely detailed as well and the modeler can pose the breech open with what looks like a breech guard hinged up or this can be shown closed with the guard down. The gun itself can be made free to elevate if you choose. As mentioned, all the external hatches and visor guards can be posed open if one wishes. The other use of photo etch is for braces on the outer fenders. I found it interesting that though there are separate track links, the instructions do not show how they are assembled. However, they are held in place by plastic pins and an alignment guide is provided. Aside from the aforementioned omission on building up the links, the instructions are well done. There is no interior color information provided, which I find to be a rather glaring omission since it comes with a full interior. I assume it is to be mostly white or off-white. There are four painting options. One is overall white, one is overall green and one has the front upper section painted in white over green. None of these three have any exterior markings. The only one that does is the box art vehicle from the 1539 SP Artillery Regiment in Karlia during June of 1944. 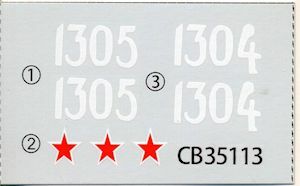 The decal sheet is nicely printed and provides the numbers and stars for this vehicle. As some of you know, Trumpeter has also released an SU-152, but that is a late version. This is the early one without the hull machine gun. I do not know if these are the same sprues as I've not seen the Trumpeter kit. I do know that this one is very nicely done and while it will take some time and careful building, it should make into an excellent replica.